Experience contemporary island style and warm, welcoming hospitality at the Hodges Bay Resort and Spa. The resort offers 79 premium accommodation choices from contemporary appointed hotel rooms to state of the art villas and penthouses. Balconies and terraces provide relaxing patio furniture and all oceanfront facing rooms have fully folding glass patio doors for sprawling, uninterrupted views of the Caribbean Sea. All bathrooms are equipped with walk-in rain showers, and some feature separate tubs. Enjoy seasonally inspired menus at four restaurants, and creative cocktails at five bars. The resort features two swimming pools including a gorgeous heated infinity pool for adults. A luxury spa offers holistic treatments designed to enhance wellness. Optional all-inclusive experiences are available. 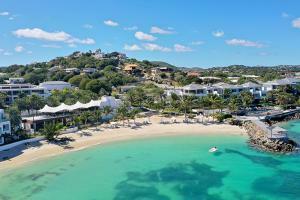 Located on Antigua's north coast, approximately 4 miles from V.C. Bird International Airport.